Description：President Xi Jinping on Monday met with The Elders delegation, led by its chair, former president of Ireland Mary Robinson, in the Great Hall of the People. 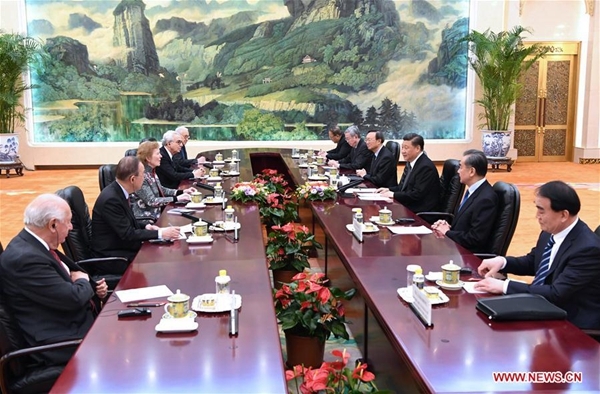 President Xi Jinping on Monday met with The Elders delegation, led by its chair, former president of Ireland Mary Robinson, in the Great Hall of the People. During their meeting, Xi said the world today was facing unprecedented changes, while the prospect of international cooperation, as well as solutions to global challenges and the future of human society were being thought on by more and more insightful people. "We advocate cultivating the awareness of a community with a shared future for humanity, and better building and caring our common home planet," Xi said, adding that every country bore a responsibility for the future of mankind. China is a major developing country, but it never evades its due international responsibilities. China seeks cooperation with win-win results and helps developing countries realize common progress during its own development process, he said. He said China had always pursued a right approach to justice and interests by putting justice before interests, and given selfless help to African countries when it was still very poor. The Belt and Road Initiative proposed by China is "for mutual benefit and win-win cooperation with all the countries," Xi said. At present, many countries have felt pressure and worries from the impact of unilateralism, but the voice of the international community in support of multilateralism has remained the dominant force. It is important to ensure that existing multilateral processes do not stall and what has been achieved is not reversed, Xi said, reiterating China's commitment in maintaining international nuclear non-proliferation regime and strengthening international cooperation on climate change and other multilateral agendas. "China always holds an open attitude towards the reform of multilateral institutions," Xi said, stressing that the reform should be discussed by all the relevant countries and accommodate the legitimate concerns of all parties in accordance with universally recognized rules, serving the common interests of majority countries. China-proposed Belt and Road Initiative is a major contribution to multilateralism and international cooperation, Xi stressed, adding that China and other participating countries have upheld the principle of consultation and collaboration for shared benefits in the past five years and created many new modes of cooperation. Xi stressed that major countries should shoulder special responsibilities as the relations between major countries concern global strategic stability. China has been committed to promoting coordination between major countries and looked forward to harmony among major countries, with no conflict or confrontation but mutual respect and win-win cooperation, Xi said. Calling China-U.S. ties one of the most important bilateral ties in the world, Xi said he hoped the United States could meet China halfway, manage differences and expand cooperation and jointly promote China-U.S. relations based on coordination, cooperation and stability so as to provide more stable and expectable factors to the world. This year marks the 70th anniversary of the founding of the People's Republic of China (PRC). Xi said it was Chinese people's choice to adhere to the leadership of the Communist Party of China (CPC). The CPC has led the Chinese people in tireless struggle and scored remarkable achievements in many areas, said Xi, adding that China had kept improving its development path and made unremitting efforts towards the "two centennial goals." "China running its own affairs well is in itself a contribution to the world," President Xi said. Mary Robinson, chair of The Elders and former president of Ireland, Ban Ki-moon, co-deputy chair, former Secretary-General of the United Nations and chairman of the Boao Forum for Asia, as well as former President of Mexico Ernesto Zedillo also spoke on behalf of The Elders. They congratulated on the 70th anniversary of the founding of the PRC and the success China had achieved in economic and social development, and spoke highly of the country's efforts made in environmental protection, poverty eradication and the work on ethnic minorities. China has played a responsible and constructive role at a crucial moment when multilateralism is faced with challenges, they said, adding that China had always adhered to the purposes and principles of the UN Charter and taken part in the cause of peace and development in Africa. Saying that Xi's speeches on international occasions had sent positive messages, they called on countries to uphold the multilateral system with the United Nations at its core and enhance multilateral cooperation in areas of international and regional stability and climate change. The Elders, initiated by former South African President Nelson Mandela in 2007, is an international non-governmental organization consisting of former leaders of countries and important international organizations. Its goal is to promote the resolution of conflict via dialogue and work on solutions for global problems such as poverty and disease. Earlier Monday, Yang Jiechi, a member of the Political Bureau of the Central Committee of the Communist Party of China and director of the Office of the Foreign Affairs Commission of the CPC Central Committee, also met the delegation.